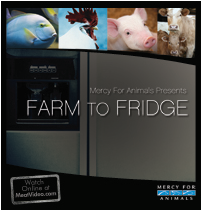 Mercy for Animals' powerful documentary, Farm to Fridge, shows the brutal realities of modern animal agriculture. We've created a website to help spread the word. Thanks to a generous donation, we have been running ads to get more folks to the site. You can get us free advertising by 'liking' the video and having your friends watch it as well. Please like this video to spread the word and help animals. Thanks!